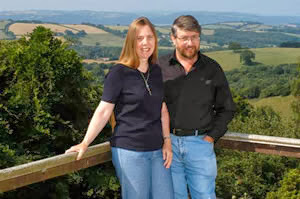 Roy and Lesley Adkins, a husband-and-wife writing team, are the authors of the new book Jane Austen's England. 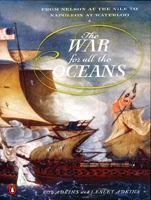 Their many other books, which focus on history and archaeology, include Jack Tar, Nelson's Trafalgar, and The War for All the Oceans. They are based in southwest England, in Devon. Q: What accounts for the continuing fascination with Jane Austen, and are you both longtime fans of her work? A: Taking the second part of your question first, Roy grew up on the borders of Berkshire and Hampshire and Lesley also spent her childhood in Hampshire – Jane Austen’s own county. We therefore learned about her at school, because she was a ‘local girl’, and we also studied her novels. Years later, while researching our naval books (Nelson’s Trafalgar, The War for All the Oceans and Jack Tar), we were fascinated to discover that two of her brothers (Frank and Charles) were officers in the Royal Navy, and so we were drawn back to her fiction. Jane Austen wrote contemporary romantic comedies that concentrated much more on brilliant dialogue than descriptive scene setting, which probably accounts for their success in being adapted for television and film. Human nature is much the same now as two centuries ago, and so her novels also have a timeless quality that can be enjoyed by anyone, anywhere, of any age. Q: You note that England was at war for much of Austen’s life, but that war did not intrude much into her books. Why do you think that was? about social problems or warfare, but you have to understand that she was writing fiction to satirise the marriage market and other customs of the day. Topics like slavery, servants, child labour and cruelty towards animals are ones that trouble us today, but were not relevant in the few novels that she managed to write. The same is true of warfare. For much of her life, Britain was at war with France and with America (the so-called 1812 War that lasted until early 1815). Particularly in southern England, including her own county of Hampshire, there was a constant dread of invasion. Although the fighting took place at sea or in foreign lands, the war was visible everywhere – from press-gangs around the coast and army units on the move to prisoners-of-war being transferred to prison depots across the country. Captured foreign officers even lived freely in the numerous parole towns, giving their word of honour (parole d’honneur) not to escape. Because books were expensive, most of Jane Austen’s readers would have been reasonably educated and well off, and they certainly needed no reminder of the bloody conflicts at sea and abroad and may well have suffered the loss of family members and friends. Jane Austen’s own brother Frank missed the Battle of Trafalgar, as Nelson sent his ship away to fetch supplies a few days earlier – like Nelson, Frank may have lost his life otherwise. Although Jane Austen did not wallow in warfare, many of her characters had a military background. With her beloved brothers Frank and Charles being in the navy, it is surely no coincidence that her fictional naval officers, such as Admiral Croft in Persuasion, are the most decent of all men. Q: How did you come up with the idea for this book, and what type of research did you conduct? A: When writing Nelson’s Trafalgar (called simply Trafalgar in the UK) and The War for All the Oceans, readers told us that they especially enjoyed the descriptions of everyday life. We went on to write Jack Tar, about ordinary seamen rather than high-ranking officers, within the timeframe 1771 to 1815, from when Nelson first entered the Royal Navy until the end of the wars. With so many men entering the navy as volunteers or being forced to join by the press-gangs, we became more and more intrigued by life on land at that time, as well as increasingly obsessed by Jane Austen (who lived from 1775 to 1817). We therefore decided to use her life and her fiction as a theme for Jane Austen’s England (Eavesdropping on Jane Austen’s England in the UK), and the dates we chose (1770 to 1817) are virtually the same as for Jack Tar. There is a tendency to compartmentalise everything, and so the world at sea rarely connects with the world on land, while the world of Jane Austen’s fiction can seem divorced from reality, particularly when viewing the television and film adaptations. We wanted to show how ordinary people fitted into the period when Jane Austen was alive and how her world and her fiction connected with the England around her. To our immense pleasure, we also found that we gained a far greater appreciation and understanding of her novels. Q: How do the two of you divide up the work as you collaborate on a book? A: Many people are horrified that as husband and wife we could possibly collaborate on a book, and so this question is frequently asked! Writing is a solitary occupation, and so we are very lucky working together, as we can constantly discuss what we are doing. Our office is a large room lined with books, with a huge window looking over Devon countryside as far as Dartmoor, providing a welcome distraction from time to time. For this book, we initially wrote a detailed proposal for the publishers, and we then divided up the chapters between us and began extensive research and writing of those chapters. Drafts would pass back and forth between us, as well as research material not relevant to our own chapters. We also spent time away from home, going to various archives, either looking for specific material or hunting down answers to specific problems. There is also the element of luck, as you never quite know what might turn up in an archive. Over the years, we have also worked as editors and copy-editors, which enables us to be constructively ruthless with our own work as we hone each draft. A: Our usual pattern was to write a book, and while it passed through the various stages of publication, we would start a new book. Particularly with the recession, we have learned to slow down and not rush towards the next book. Having spent so long writing Jane Austen’s England, we feel it is much more important to ensure that the book is a success and that as many potential readers as possible get to hear about it so that they can choose whether they wish to buy it. Here in the UK, and we suspect elsewhere as well, we can no longer rely on big bookstore chains stocking piles of books and doing their utmost to generate sales. It is therefore essential to reach out to readers in other ways, and so we have been spending the last few months writing magazine articles, doing website interviews, adding to our own website and giving numerous talks, mainly at literary festivals across the country. Next year is the 200th anniversary of the publication of Mansfield Park, a novel that is set partly in the naval port of Portsmouth, with a naval theme running through the book. We therefore hope to be able to do several more talks in 2014, something that we very much enjoy, as it provides an opportunity to meet readers face-to-face. We also have two or three ideas for a new book, and so after Christmas we plan to sit down and start to do the research needed to put together a proposal to submit to the publishers. A: That is a tantalising question, as we could continue at length with various topics! Our own website is www.adkinshistory.com, and there is a great deal more information about us and our books there. Between us, we have written eighteen books that have been translated into seventeen languages worldwide. For those of you who think you have no interest in Jane Austen, do take a look at our latest book, as we have made a few converts already! We also send out e-newsletters about four times a year, which anyone can sign up for free-of-charge, and back numbers are on our website. And finally, Deborah, many thanks for inviting us to do this interview on your blog – very enjoyable and much appreciated.